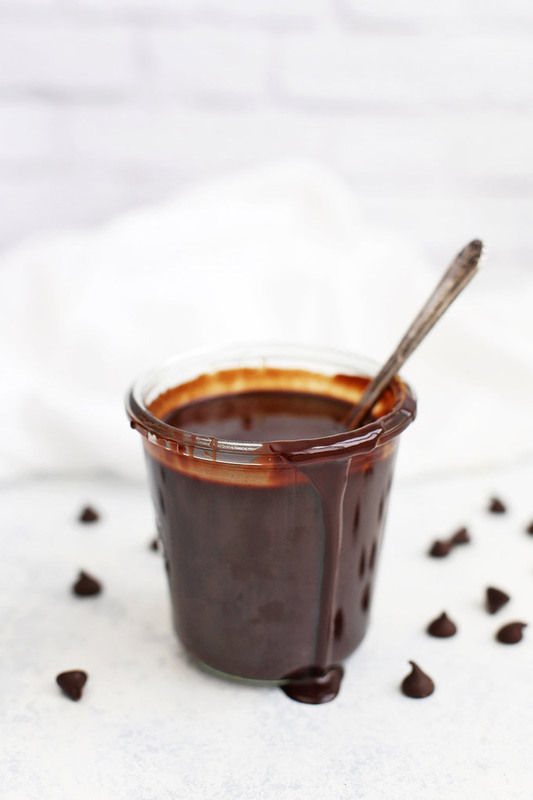 Vegan Hot Fudge Sauce – You’d never guess this gorgeous chocolate sauce is dairy free! It’s exactly what you want on an ice cream sundae–thick, chocolatey, and perfectly sweet. For his birthday this year, Michael requested brownie sundaes. 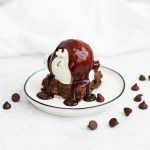 It had been YEARS since I’d had one, and I knew that while I have an amazing brownie recipe, and know all about great dairy free ice cream options (see my notes below), I really needed a good hot fudge sauce recipe. But…we needed one that was dairy free. First off, it has that amazing almost “chewy” quality that’s what makes hot fudge so gloriously different than a hard magic shell topping. It’s the kind of sauce that’ll slowly drip down the sides of your ice cream, so that when you take a bite, you get delicious warm brownies, cold creamy ice cream, and thick, gooey hot fudge sauce that’ll make you want to shout amens and hallelujahs. Second, I was able to make it without using corn syrup (which is how many recipes achieve that gloriously decadent texture). I swapped it out for brown rice syrup, which is literally just made from boiling down brown rice to make a syrup. It’s more mildly sweet and has caramel-y notes I just love. We also use it to make our homemade granola bars and homemade scotcheroos. It helps make the sauce nice and thick (it won’t be completely solid, even in the fridge). Chocolate chips finish the job, by adding a final layer of chocolate-y goodness. It’s easier and easier to find dairy free chocolate chips these days. (I love the Guittard dark chocolate chips and Enjoy Life brands). They’re absolutely lovely here, and you can use whatever chocolate you prefer–I like semi-sweet or dark. 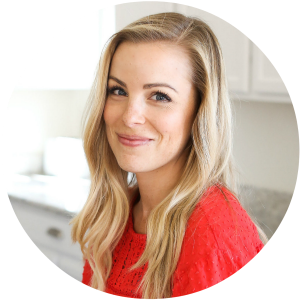 My Favorite Dairy Free Ice Cream – I REALLY need to do a full post about different dairy free ice creams, but one brand I consistently recommend is NadaMoo. The texture is really lovely. It’s soft and scoop-able, when many other dairy free ice creams can be hard and icy. They have LOTS of yummy flavors–I find it at Sprouts or Whole Foods. Milk – you can use just about any dairy free milk. Coconut milk will give you a thicker result and the coconut flavor will come through taste-wise. I prefer using almond or cashew since they’re more neutral. I recommend unsweetened. Brown Rice Syrup – the only substitute you could swap here is corn syrup. It’ll give you that almost “chewy” texture that store-bought or traditional sauces have, but I really don’t use it any more. Do know, it will be VERY sweet if you use corn syrup. You can’t use honey, maple syrup, or agave. The end result will be too sweet and too thin. Coconut Sugar– any granulated sweetener you like will work. Brown sugar gives a really nice flavor, or you can always use white sugar or maple sugar. I haven’t tested this with stevia or erythritol, etc. How to Store & Reheat – This makes about 2 cups of sauce, which is PLENTY. It’ll keep in the fridge at least a week. You can reheat it all together in the jar or container you’re storing it in, or you can pull out a few tablespoons at a time. To microwave, go slowly, microwaving 20 seconds at a time, stirring regularly to avoid scorching. To heat on the stovetop, simply reheat over low heat in a saucepan. Need a Vegan Brownie Recipe? I haven’t tried them, but these gluten free & vegan brownie cups look perfect! 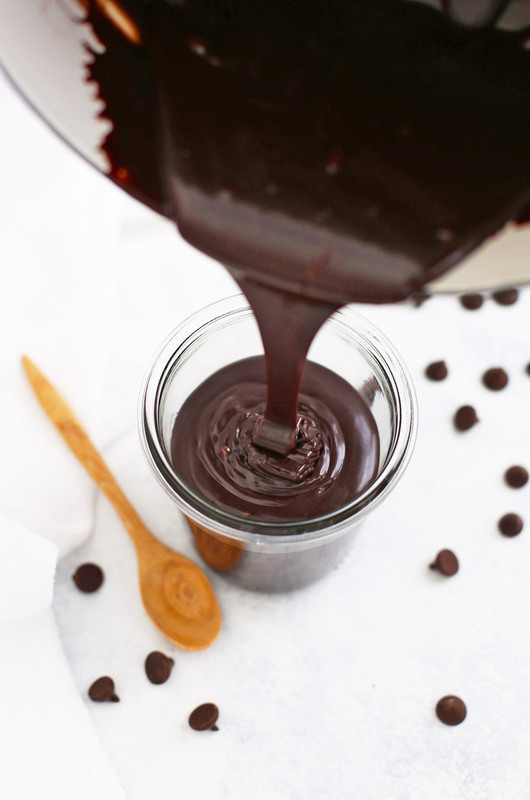 You’d never guess this gooey chocolate sauce is dairy free! 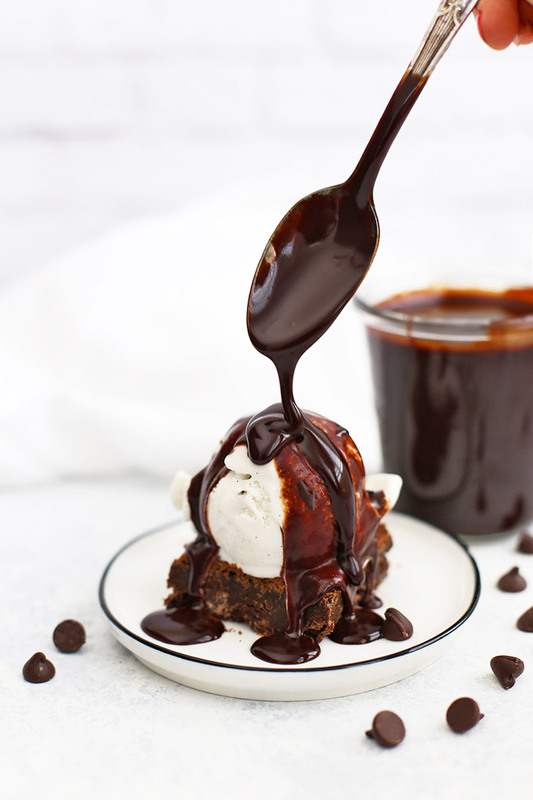 Rich, chocolatey, and delicious, it’s everything hot fudge sauce should be! In a medium saucepan, combine coconut oil, coconut sugar, cocoa powder, salt, brown rice syrup, and 1/3 cup almond milk. Bring to a boil over medium heat and simmer 3-5 minutes to thicken, whisking regularly. Stir in chocolate chips and vanilla. 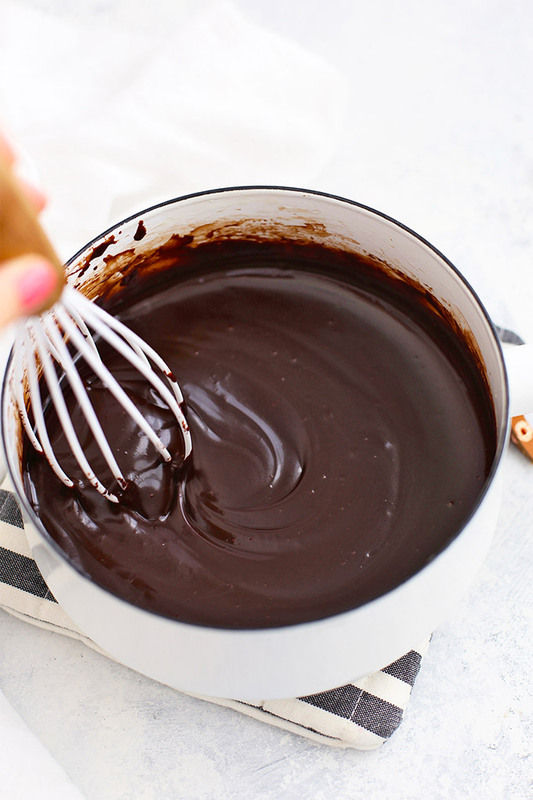 Whisk to dissolve chocolate and continue whisking until glossy, thick, and smooth. Taste and add additional salt, as desired. Cool 10-15 minutes before serving. Note: sauce WILL THICKEN more as it cools. If your sauce seems thicker than you like, add a few more tablespoons of almond milk to thin it out. This makes about 2 cups of sauce, which is PLENTY. It’ll keep in the fridge at least a week. You can reheat it all together in the jar or container you’re storing it in, or you can pull out a few tablespoons at a time. To microwave, go slowly, microwaving 20 seconds at a time, stirring regularly to avoid scorching. To heat on the stovetop, simply reheat over low heat in a saucepan. I need this in my life! It looks all sorts of amazing! YAY! We just made some last week to go on peppermint brownie sundaes. So good!! I know you said not to use agave, but I did it before reading that tip. It was all I had on hand, anyway. My hot fudge still came out thick and not overly sweet at all! Maybe I did use a bit less sugar than called for (and I used organic regular sugar). Unlike you said the corn syrup would do, it didn’t have that “chewy” texture, but it was still very good! Oh, I’m SO GLAD! That’s great to hear! 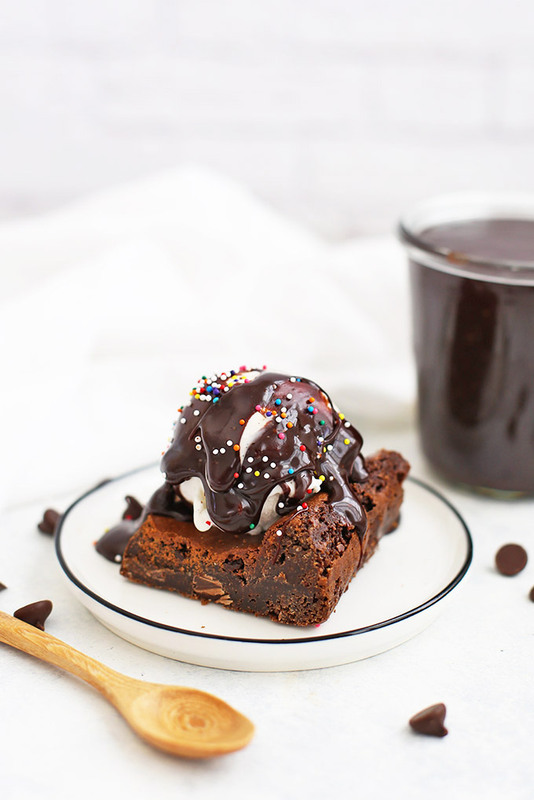 This fudge sauce is seriously amazing! I looked up a few different recipes, doubtful of whether I could find something that would rival classic (dairy-containing) chocolate sauce… but having recently switched to dairy free I can say with confidence that this recipe really is just as good, if not better. I made it to put on crepes, which was fantastic, but honestly now I just eat the leftovers off a spoon, drizzle over cereal, spread on toast… it is delicious any way you have it. I used corn syrup and regular sugar, and didn’t find it to be too sweet at all. I also have been using good quality dutch-processed cocoa (Droste brand), which gives this a really rich, deep, delicious chocolate flavor. Sarah, I LOVE hearing that! I love a good Dutch cocoa. Thanks so much for sharing!